A beautifully written book about a true person called James Bowen who was a homeless busker who met a street cat called Bob!! The two became inseparable and, after James nursed Bob back to health, Bob started to join him everyday on his busking pitches, later at his pitches selling The Big Issue. A chance meeting with a publisher walking past led to James being offered a publishing deal to write his story. 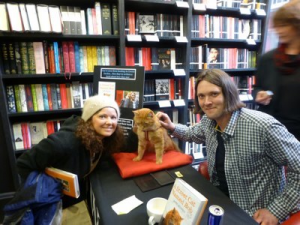 Above is a photo of me, James and Bob at their book signing at Waterstones Covent Garden. A lovely true inspirational story. A must read book.